Property Tax: Will your profits be subject to income or capital gains tax? On the disposal of a property it is likely that a profit or loss will arise. This profit or loss will be taxable as income or capital dependent on whether the activities are trading or investment activities i.e. are you a property developer or a property investor? This will directly impact upon the availability to offset losses, claiming of relevant tax deductions as well as the rates of tax applicable. Broadly, if the activities constitute a trade then the profits or losses are subject to income tax, however, if the activities are of an investment nature then the capital gains rules will apply. How to determine whether the property should be treated as a trade or investment? The tax legislation is not clear when providing a definition of a trade and it has been the courts that have provided additional guidance on this. The six “badges of trade” below are used to guide the courts when determining the line between trading and investment activities. Case law has indicated that the most important factor tends to be the motive and intention of the taxpayer at the time of the acquisition of the property. It is worth noting that an intention to dispose of property at a profit at some time in the future does not automatically mean there is an intention to trade and it is important that all factors are considered together. Even if the profits are not characterised as trading profits, there are specific income tax anti-avoidance provisions which can potentially re-categorise capital gains as income for tax purposes (however there would not be any corresponding national insurance liability should these provisions apply). the land is developed with the sole or main objective of realising a gain when the land is sold. HMRC typically seek to apply these provisions where a scheme or arrangement is entered into which effectively entitles the landowner to a share in the profits of the developer. The company will be subject to corporation tax on the profit on disposal (currently 20% reducing to 19% with effect from April 2017 and 17% with effect from April 2020). If a loss on disposal was to arise, the company could offset this against other income in the current year, carry back against income of the previous year or carry forward to be offset against future profits of the same trade. Individuals will be subject to income tax on the profit on disposal at up to 45% (20% for basic rate tax payers and 40% for higher rate tax payers) as well as national insurance. If a loss on disposal was to arise this may be offset against other income in the current year or the previous year. However, if offset against other income (i.e. not additional income from the same trade) the loss relief is restricted to the greater of £50,000 or 25% of an individual’s adjusted net income. Losses may also be carried forward to be offset against future profits of the same trade. George buys a rundown 2 bedroom property with the intention to renovate it as soon as possible then subsequently selling it on at a profit. He then plans to reinvest any proceeds from the sale into further properties to do up and sell. Due to market conditions George realises a loss on disposal of £25,000. As George’s main motivation is to buy the property to make a profit from doing it up and selling it on, this would suggest that George is trading. In the tax year George has adjusted net income of £20,000 and so he can claim £20,000 of the loss in the current year with the remaining £5,000 carried forward. Gains on disposal will be subject to corporation tax (same rates applicable as above). Indexation allowance to allow for inflation will be available to reduce any gain. In the event of a loss, this can be offset against other current year capital gains or future capital gains only. With effect from 6 April 2016, any gains on disposal of residential property will continue to be subject to capital gains tax (“CGT”) at 18% or 28% depending on the individual’s marginal rate of income tax and indexation allowance is no longer available for individuals. Each individual has an annual exemption for CGT purposes, which is currently £11,100. 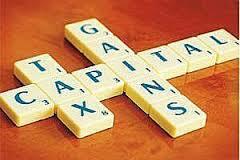 Capital losses may be offset against other capital gains in the current year or future capital gains only. Harry buys a 2 bedroom property with the intention to keep it as a long-term investment. He renovates the property with a view to renting it out. However, due to changes in his personal circumstances, he sells the property after completing the renovations 2 years later realising a profit of £30,000. Harry’s original intention at acquisition was to hold the property as an investment and even though the property was sold after a short period of time, the original motive and intention had not changed. The `profit’ that he made on the property should therefore be charged to CGT. Whilst every effort has been made to provide information current at the date of publication, tax laws around the world change constantly. Accordingly, the material should be viewed only as a general guide and should not be relied on without consulting your local KPMG tax adviser for the specific application of a country’s tax rules to your own situation. If you need assistance with any related matters, please do e-mail Simon at simon.johnson@kpmg.co.uk. Next Post Kitchen Done, But What About The Bathroom?